the whole of the West Midlands is set to benefit from high speed rail. However, the primary beneficiaries will be the businesses and residents of Birmingham through new, faster and more frequent rail services making both meetings with business partners and leisure trips much more accessible. Although AWM is supposedly responsible for economic development in the West Midlands region, the website virtually ignored anywhere outside the much smaller West Midlands county (made up of Birmingham, the Black Country, Solihull, and Coventry). But the the HS2 terminal in Birmingham doesn’t fit that definition. It is badly sited in relation to the city centre, and to other transport links. It would be a dead end, served off by a branch off the HS2 trunk at Coleshill, and the government’s plans don’t mention a hub and spoke system of high speed lines, with Birmingham as the centre. There aren’t plans to upgrade the existing lines from Birmingham to the East Midlands, South West, and North East, let alone build new ones. High speed rail will significantly reduce travel times to London when the line between London and Birmingham is completed in the mid 2020s. The journey from Birmingham to London will reduce to approximately 45 minutes. As the high speed line is extended north to Manchester, Leeds and beyond there will be additional benefits of reduced journey times to these locations: the journey time from Birmingham to Manchester will be approximately 40 minutes and Leeds 1 hour and 5 minutes. Higher speed is not the only or best way of cutting journey times. Nor is it without cost. Increasing the maximum speed of a train from 200 km/h to 350 km/h means a 90 per cent increase in energy consumption. In exchange, it cuts station-to-station journey time by less than 25 per cent and door-to-door journey-time by even less. This outcome is observed with HS2 journeys to London starting or finishing in Wolverhampton, Walsall, Stourbridge, Dudley, Walsall, West Bromwich, Solihull, and Coventry, as well as much of Birmingham itself. The poor spatial relationship of the Birmingham and Bickenhill stations to journey origins and destinations, and the discontinuities involved in reaching them, make HS2 unattractive both in time, and in the need to change en route. all of which cannot match the speed or convenience of the one-hour journey on the existing line (which could probably be speeded up anyway). Likewise, driving by car from Coventry to Bickenhill HS2 station wouldn’t be time competitive. Neither existing public transport nor car travel to HS2 would be attractive from the Black Country (whose population is as large as Birmingham). central West Bromwich is not part of the national rail network. Fastest access to HS2 Birmingham would be via the Midland Metro tramway – which stops every kilometre – then bus or train from Snow Hill to Curzon Street. central Dudley has no passenger rail services at all, and there are no firm plans to provide any. Public transport access to HS2 would involve a tortuous combination of bus, train, walking, and people mover, depending on access being at Curzon Street or Bickenhill. Under the first stage of HS2, the fast track would end in Staffordshire. Although no details of a HS2 route from the West Midlands (i.e., Birmingham) to Manchester have been released, the relatively short distance between the cities means that there is no prospect of significant time savings for journeys between the two conurbations, with or without new track. Manchester-bound HS2 trains from Birmingham would start out heading out in the wrong direction (east, not north-west) and would be slower on existing tracks (because they would not be able to tilt, unlike Pendolinos). High Speed Two: fair and affordable? “average fares will be around £40 for a single journey and many will actually travel for much less — around the £20 mark”. I don’t know how Mr Steer would be able to foretell what the operators of HS2 would charge for travel in 2025. But perhaps he’s got a record of accurately predicting the costs of goods and services 15 years or more into the future. What is known, are the fares charged on existing high speed lines now, and in the past. On Deutsche Bahn AG (DBAG), it has long been the practice to charge extra for travel on fast trains. This policy was applied by Deutsche Bundesbahn, a predecessor of DBAG, even on InterCity services that used only existing track (i.e., not just InterCity Express services using the new-build fast lines). It was also the practice of the Reichsbahn to charge extra to travel on faster trains. In France, SNCF used to claim that the TGV allowed people to travel at high speed, for the price of an ordinary ticket. In practice though, the Paris to Lyon LGV high speed service required purchase of an obligatory reservation from the very start. With the opening of the LGV Atlantique (Paris to Le Mans and Tours), an additional premium was added into the compulsory reservation, which became a tiered supplement known as ‘Resa’. A premium fare element was then introduced into the entire network operated with TGV trains. So European operators, including Southeastern in Great Britain, charge a premium for high speed travel. What isn’t clear is the usage demographics in each country. Even if data were available, comparisons with Britain would be complicated, because an intercity coach travel network doesn’t really exist in France and Germany. On 16 January 2011, BBC Television’s Countryfile had a feature on High Speed Two, with an interview with Julie Mills, from the lobbying company Greengauge 21. 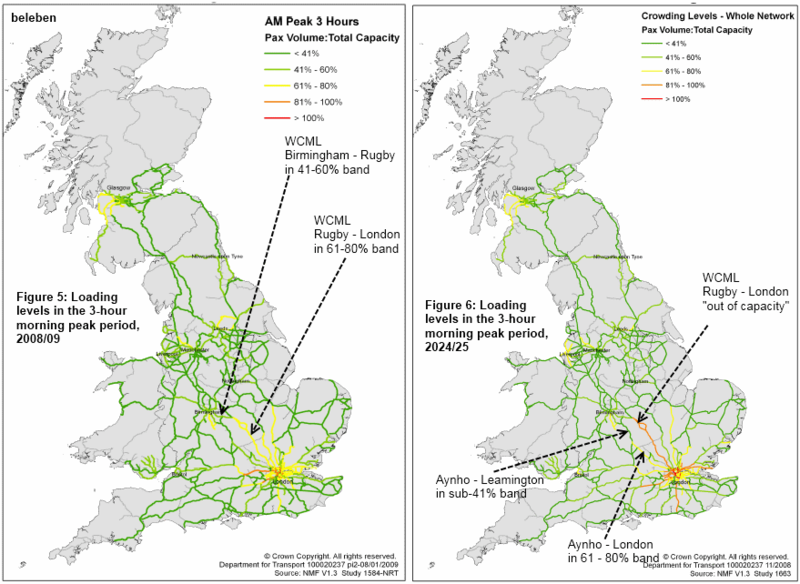 The January 2009 Department for Transport report ‘Britain’s Transport Infrastructure: High Speed 2‘ contained a map of rail capacity utilisation for a three hour morning peak period in 2008-2009 (Figure 5) and a corresponding prediction for 2024-2025. These are reproduced below, with annotations for clarity (originals are Crown copyright). The 2008-2009 diagram doesn’t support Mr Ainsworth’s claim that the network as a whole is operating at “maximum capacity”. And the claim that “huge investment” is required for any capacity increase at all, is clearly false. At the moment, on the West Coast Main Line, capacity is being increased simply by adding an extra carriage to Pendolino trains. Further relatively inexpensive gains are possible through, for example, adding a fourth WCML track between Attleborough and Brinklow. Judging by past attempts at estimating rail demand, it would be unwise to attach much credence to DfT’s 2024-2025 estimate for capacity utilisation. Given the amount of money involved in HS2, it’s surprising that so little attention has been paid to whether HS2 would even be the best way to increase capacity, if such demand materialised. A HS2 alternative such as upgrading the underused Chiltern Line would offer the possibility of creating still more capacity by transferring express London to Birmingham services from the West Coast Main Line. Upon Crossrail‘s completion, platforms at Paddington Main Line station would become available for Birmingham Chiltern intercity services, and the Birmingham approach from Lapworth has space for four tracks. At the current service level, Birmingham Chiltern intercity would remove three paths hourly in each direction from the WCML between Rugby and London Euston. If the underperforming Midland Metro tramway between Birmingham and Wolverhampton were closed down, its trackbed could be restored for railway use, enabling Wolverhampton to London trains to run via the Chiltern Line. Using this route, it’s likely that Wolverhampton to London and West Bromwich to London journey times would be shorter than with HS2. High speed trains have a need for relatively large separation distances, owing to their longer stopping distances. This reduces capacity (trains per hour) compared with a conventional line. HS2 attempts to mitigate by making the individual trains longer (up to 400 metres), but this creates problems of its own with yield management, and the physical handling of trains. Essentially, HS2 creates capacity in lumpy blobs, rather than capacity attunable to market requirements. This is not a recipe for financial success, so it’s just as well that Philip Hammond is looking to commit future governments to subsidising HS2 losses, as well as paying the construction costs. and the largest non-statutory provider of such services in the world. wmsnt is both a charity and a not-for-profit company, whose main activity is the provision of paratransit for people who find it difficult or impossible to use standard public transport in the Black Country (Walsall, Wolverhampton, Sandwell, Dudley), Birmingham, Solihull, and Coventry. In rural Solihull, wmsnt runs a demand responsive Taxibus. Its other businesses include contract transport for schools, and criminal record services. Most of wmsnt’s funding comes from the West Midlands Integrated Transport Authority (WMITA, i.e. Centro), but the core £12 million annual provision faces reduction as part of wider public spending cuts. In response, Centro set up a survey inviting Ring and Ride users to express an opinion on either reducing service levels, or introducing a usage charge. Given that primary public transport in the West Midlands is poorly adapted to the needs of people with reduced mobility, it’s good that an alternative exists, albeit limited. But it has to be asked why so little effort is put into making the standard rail and bus network more accessible. Millions of pounds have been found for one of Centro’s obsessions – station car parks (park and ride) – but facilities like Stechford station remain unremittingly inaccessible to wheelchair users, parents with young children, cyclists, etc. Of course, the other question is whether it’s a good idea to have wmsnt as the monopoly supplier of paratransit services, and several WMITA councillors serving on the wmsnt board. At the time of writing, wmsnt doesn’t even publish its accounts on its website (just an annual report), and it’s not at all obvious how efficient it is. For example, it appears to replace its minibuses every five years, but whether this is necessary or desirable, is unknown. What is it with Birmingham Labour Party and carbon emissions? A few years ago, Birmingham’s then-Labour council sanctioned a millennium flame “wok on a stick” in the city centre’s Centenary Square, which ended up burning £12,000 of gas each year. The council also decided that motorists should be encouraged to use public transport on the Tyburn Road. A bus-only lane was carved out of its road space, but hardly any buses used it. So motorists were left sitting in stationary traffic, looking at an empty bus lane. Eventually, the bus lane was removed, and with it went the traffic jams it had created. The flame of “hope” was turned off as well. Um, hello? In carbon reduction terms, the biggest benefit is not having the bus lane **during the peak hours**. Because HS2 is intended as a 400 km/h railway, its curves have to be of large radius – i.e., the line has to be relatively straight. As far as Ms Hartley is concerned, if you’re in the way and, er, don’t vote Labour, well, that’s tough. A 400 km/h railway is a very carbon-emissive railway. Because, in general, the faster a train goes, the more energy it uses, and the amount required increases roughly as the square of the speed. The effect can be seen in an estimate of primary fuel requirements by mode for a London to Edinburgh journey, presented by Lancaster University’s Professor Roger Kemp. The comparison included trains running at 225 km/h, and 350 km/hr. It’s clear that HS2’s design maximum of 400 km/h wouldn’t fit on the graph. Of course, none of this matters for a trainspotter. Or a politician revelling in ignorance, supporting empty bus lanes, and burning gas in Centenary Square. In 2009, in a policy reversal instigated by Andrew Adonis, the then Labour government announced plans to build High Speed 2 (HS2), a twin track express railway between London and the West Midlands. It established a company, High Speed Two Limited (HS2 Ltd), to develop the scheme. Like High Speed 1 – the Channel Tunnel Rail Link between London and Folkestone – HS2 was intended as a railway primarily for passenger use, capable of handling 400-metre long trains built to the so-called European high speed loading gauge. The ultimate vision was to build a HS2 trunk line all the way to northern England and Scotland, but as an interim measure, the initial GBP17 billion London to West Midlands phase would include a connection with the existing (‘classic’) West Coast Main Line in Staffordshire. This would allow ‘classic compatible’ trains from northern England to run onto HS2 for the London approach. There would be no intermediate stations between the West Midlands and Greater London. Instead of using New Street station, Birmingham city centre was to have its own purpose built terminus, served by a spur line running from the HS2 trunk at Coleshill. A second West Midlands ‘Birmingham interchange’ station would be located on the HS2 trunk in rural Bickenhill, near Birmingham Airport. The difficult location of this interchange meant that a “people mover” would be needed to be built to connect the station with the airport and Birmingham International railway station. In London, a rebuilt Euston station would serve as the central London terminus for HS2 and trains arriving from the ‘classic’ Milton Keynes (West Coast) line. Heathrow Airport was to be served from a ‘Crossrail interchange’, at Old Oak Common. To maximise journey time savings, the line would be built for 400 km/h operation, but some sections, such as tunnels, would have a lower limit. As such high speeds need relatively straight track, the route would not be able to follow existing transport routes. The Conservative – Liberal Democrat coalition, formed in May 2010, is enthusiastic about HS2, but has announced changes to parts of the route, and the inclusion of a north London connection between HS2 and HS1 as part of the initial phase. However, coalition ministers binned their idea of a first-phase station at Heathrow Airport, in favour of Labour’s concept of a West London interchange. It’s not too surprising that this is an anonymous quote, and doesn’t appear in the Council’s consultation records. Because the High Speed Two project was only announced and named by the government in 2009, yet the Core Strategy issues and options consultation closed in October 2008 (picture below shows link content).